Promoting Hygiene In The Workplace. Every year we seem to have a scare about a new strain of ‘flu’ or a new superbug being discovered, meaning that along with anti-bacterial hand gels being available on every supermarket counter that we can now buy everything, from toys through to socks that come complete with anti-bacterial properties. Use paper towels instead of cloth towels, which can harbour more germs. Regularly steam clean carpets to get rid of underlying dust and dirt, vacuuming alone will only remove 80% of carpet dirt. Phones and keyboards are common sources of bacteria and should be disinfected regularly. Control stress. Studies show that people experiencing stress have weakened immune systems and are more likely to become ill than their calmer counterparts. 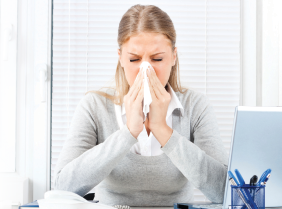 Finally, consider sending home employees who turn up for work ill, to avoid infecting colleagues. Ensure Your Workplace Is Clean And Healthy. Millions of workdays are lost every year as a result of germs which can cause everything from colds and ‘flu’ through to upset stomachs. Germs and bugs are difficult to control and it can be a major problem in busy workplaces where there can be hundreds or even thousands of people passing through every day, and where reportedly computer keyboards can harbour bacteria containing more germs than public toilets. The cost of these illnesses to employers is more than just Statutory Sick Pay because there’s a knock-on effect for the wider workforce, for example, low morale if people are having to cover for sick colleagues and loss of income due to sales being missed or work not getting done. Effective workplace cleaning and housekeeping routines can eliminate some of these germs, and also can contribute to getting a job done safely and properly. Poor housekeeping can frequently contribute to accidents by hiding hazards that cause injuries. If the sight of paper, debris, clutter and spills is accepted as normal, then other more serious health and safety hazards may also be taken for granted. ...How To Prevent Occupational Dermatitis? Work-related contact dermatitis can be severe enough to keep you off work or even force you to change jobs. The prime responsibility for the prevention of occupational dermatitis lies with the employer. A risk assessment should be carried out on the likelihood of the employees developing contact-related dermatitis. Where there is a risk, adequate control measures, information, instruction and training should be provided. Avoid contact with cleaning products, food and water where possible, e.g. use a dishwasher rather than washing up by hand, use utensils rather than hands to touch food. Protect your skin. Where you can, wear gloves when working with harsh chemicals that can cause dermatitis and moisturise your hands to replenish the skin’s natural oils. Often working with water regularly can be enough to cause symptoms of dermatitis so ensure hands are always protected. Check your hands regularly for the early stages of dermatitis, ie itchy, dry or red skin. These symptoms should be reported to a supervisor, as treatment is much more effective if dermatitis is caught early.